Wales coach Warren Gatland admitted he will find it hard to support Australia when they play England on Saturday. A Wallabies win will knock England out of the World Cup and send Wales, who beat Fiji 23-13 on Thursday, through to the quarter-finals. New Zealander Gatland said: "If we were being selfish about our own destiny Australia can do us a big favour. Wales's win over Fiji saw them move to the top of Pool A on 13 points - four ahead of Australia and seven in front of England. Wales, England and Australia can all still qualify for the quarter-finals but only the top two in Pool A will go through. With four points for a win, one bonus point for a team that scores four or more tries in a match, and one point if you lose by seven points or fewer, the permutations are many. 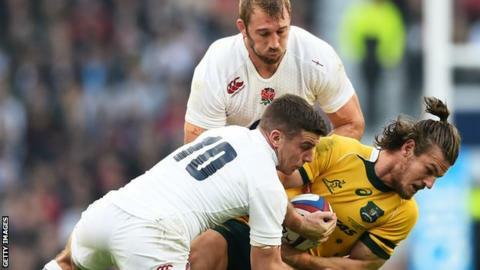 If England beat Australia, then the tournament hosts will be favourites as their final game on 10 October is against minnows Uruguay - both Wales and the Wallabies recorded bonus-point victories over the South American side. A bonus-point win for England would mean the match between Australia and Wales, earlier on the same day at Twickenham, would decide the other qualifier from the so-called pool of death. There is a scenario that could see Wales and England finish on the same points. If that were to happen, Wales would go through because they won last Saturday's pool match. Should Australia lose to England and then beat Wales there is also the possibility of all three teams finishing on the same points and then points difference comes into play. The Welsh have lost their last 10 meetings with Australia, but captain Sam Warburton believes there has been little between the teams. The last five meetings between the sides have seen the Wallabies win by five points or fewer. "We take a lot of confidence from those defeats because it's been a penalty decision, or one guy coming out of the line in the last minute - really the finest margins you can probably get in Test rugby," said Warburton. "So we know that we have the makings to get a win against Australia, but I've seen some of their games recently and they are looking particularly good. "It's going to be another huge battle between England and Australia and then between us and Australia - it's going to be an exciting week."